I can’t wait for UbuCon Summit to start. The list of attendees is growing and with some of the folks it’s been ages since I met them in person the last time. For me that’s the number one reason to be there. Catching up with everyone will be great. The schedule for UbuCon Summit is looking fantastic as well. We have many many great talks and demos lined up from a really broad spectrum, there’s going to be much to learn about and there’s going to be more surprises coming up in the unconference part of UbuCon. Ubuntu has been around for just over a decade. That’s a long time for a project built around a field that evolves at such a rapid pace as computing. And not just any computing –software made for (and by) human beings, who have also inevitably grown and evolved with Ubuntu. Over the years, Ubuntu has changed and has lead change to keep thriving in such a competitive space. The first years were particularly exciting: there was so much to do, countless possibilities and plenty of opportunities to contribute. Everyone that has been around for a while has fond memories of the Ubuntu Developer Summit, UDS in short. An in-person event run every 6 months to plan the next version of the OS. Representatives of different areas of the community came together every half year, somewhere in the US or Europe, to discuss, design and lay out the next cycle, both in terms of community and technology. It was in this setting where Ubuntu governance and leadership were discussed, the decisions of which default apps to include were made, the switch to Unity’s new UX, and much more. It was a particularly intense event, as often discussions continued into the hallways and sometimes up to the bar late at night. In a traditionally distributed community, where discussions and planning happen online and across timezones, getting physically together in one place helped us more effectively resolve complex issues, bring new ideas, and often agree to disagree in a respectful environment. Change takes courage, it takes effort in thinking outside the box and going all the way through, but it is not always popular. I personally believe, though, that without disruptive changes we wouldn’t be where we are today: millions of devices shipped with Ubuntu pre-installed, leadership in the cloud space, Ubuntu phones shipped worldwide, the convergence story, Ubuntu on drones, IoT… and a strong, welcoming and thriving community. At some point, UDS morphed into UOS, an online-only event, which despite its own merits and success, it does admittedly lack the more personal component. This is where we are now, and this is not a write-up to hark back to the good old days, or to claim that all decisions we’ve made were optimal –acknowledging those lead by Canonical. 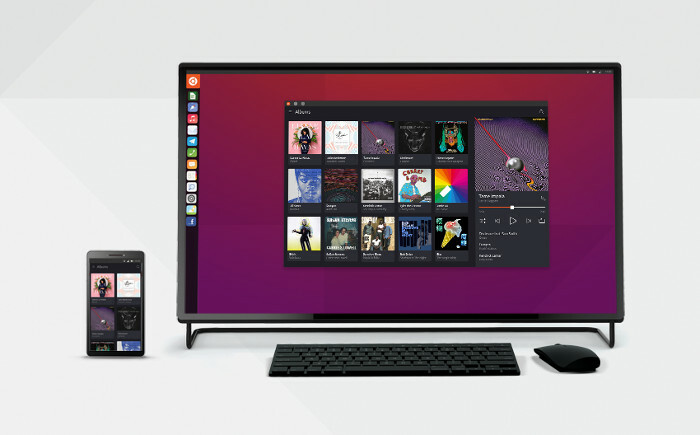 Ubuntu has evolved, we’ve solved many of the technological issues we were facing in the early days, and in many areas Ubuntu as a platform “just works”. Where we were seeing interest in contributing to the plumbing of the OS in the past, today we see a trend where communities emerge to contribute taking advantage of a platform to build upon. Yet Ubuntu is just as exciting as it was in those days. Think about carrying your computer running Ubuntu in your pocket and connecting it to your monitor at home for the full experience, think about a fresh and vibrant app developer community, think about an Open Source OS powering the next generation of connected devices and drones. The areas of opportunity to get involved are much more diverse than they have ever been. And while we have adapted to technological and social change in the project over the years, what hasn’t changed is one of the fundamental values of Ubuntu: its people. To me personally, when I put aside open source and exciting technical challenges, I am proud to be part of this community because its open, welcoming, it’s driven by collaboration, I keep meeting and learning from remarkable individuals, I’ve made friendships that have lasted years… and I could go on forever. We are essentially people who share a mission: that of bringing access to computer to everyone, via Free Software and open collaboration. And while over the years we have learnt to work productively in a remote environment, the need to socialize is still there and as important as ever to reaffirm this bonding that keep us together. UbuCons are in-person conferences around the world, fully driven by teams of volunteers who are passionate about Ubuntu and about community. They are also a remarkable achievement, showing an exceptional commitment and organizational effort from Ubuntu advocates to make them happen. Unlike other big Ubuntu events such as release parties -celebrating new releases every six months- UbuCons happen generally once a year. They vary in size, going from tens to hundreds to thousands, include talks by Ubuntu community members and cross-collaboration with other Open Source communities. Most importantly, they are always events to remember. A few months back, at the Ubuntu Community Team we started thinking of how we could bring the community together in a similar way we used to do with a big central event, but also in a way that was sustainable and community-driven. The existing network of UbuCons came as the natural vehicle for this, and in this time we’ve been working closely with UbuCon organizers to take UbuCons up a notch. It has been from this team work where initiatives such as the UbuContest leading to UbuCon DE in Berlin were made possible. And more support for worldwide UbuCons general: in terms of speakers and community donations to cover some of the organizational cost for instance, or most recently the UbuCon site. It has been particularly rewarding for us to have played even a small part on this, where the full credit goes to the international teams of UbuCon organizers. Today, six UbuCons are running worldwide, with future plans for more. But we were not content yet. With UbuCons covering a particular geographical area, we still felt a bigger, more centralized event was needed for the community to rally around. 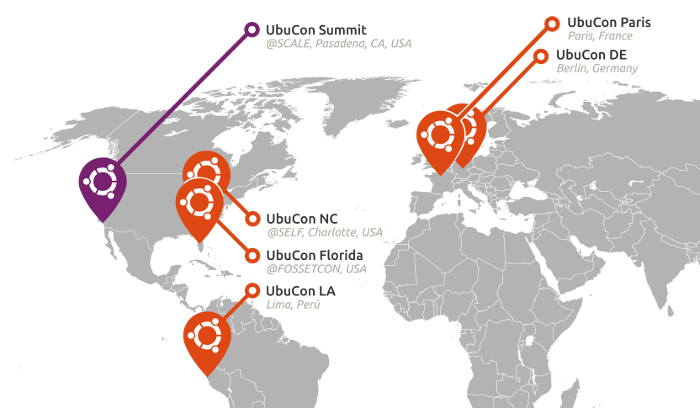 The idea of expanding to a bigger summit had already been brainstormed with members of the Ubuntu California LoCo in the months coming to the last UbuCon @ SCALE in LA. Building up on the initial concept, the vision for the Summit was penciled in at the Community Leadership Summit (CLS) 2015 together with representatives from the Ubuntu Community Council. An UbuCon Summit is a super-UbuCon, if you will: with some of the most influential members of the wider Ubuntu community, with first-class talks content, and with a space for discussions to help shape the future of particular areas of Ubuntu. It’s the evolution of an UbuCon. Jono Bacon, who we have to thank for participating in and facilitating the initial CLS discussions, wrote an excellent blog post on why you should go to UbuCon in LA in January, which I highly recommend you read. I’m really looking forward to meeting everyone there, to seeing old and new faces and getting together to keep the big Ubuntu wheels turning. The post Ubuntu is about people appeared first on David Planella. Today marks another Ubuntu Community Appreciation Day, one of Ubuntu’s beautiful traditions, where you publicly thank people for their work. It’s always hard to pick just one person or a group of people, but you know what – better appreciate somebody’s work than nobody’s work at all. One person I’d like to thanks for their work is Michael Hall. He is always around, always working on a number of projects, always involved in discussions on social media and never shy to add yet another work item to his TODO list. Even with big projects on his plate, he is still writing apps, blog entries, charms and hacks on a number of websites and is still on top of things like mailing list discussions. I don’t know how he does it, but I’m astounded how he gets things done and still stays friendly. I’m glad he’s part of our team and tirelessly working on making Ubuntu a better place. I also like this picture of him. Mike: keep up the good work! I’ve been using Google+ Hangouts for a while and some of you might have seen that Jono posted some evidence of these. Mostly I just used them for team calls with a fixed agenda or to keep in touch with friends. 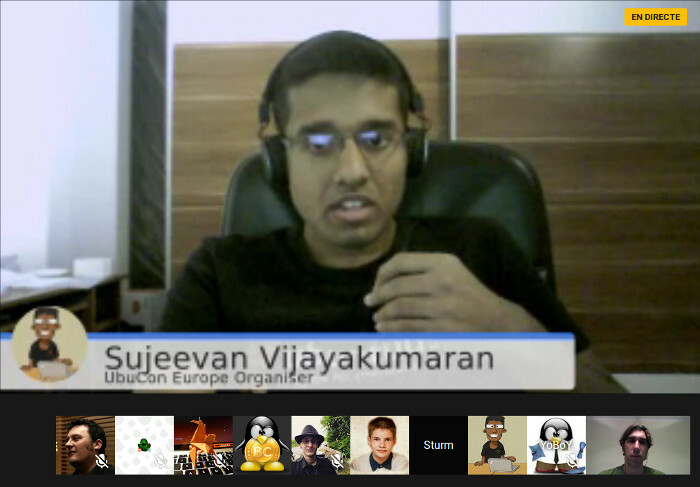 Yesterday I did a free-for-all hangout, using the new “named hangout” feature of Google+. It’s basically like a chat room with a fixed URL, where you can discuss whatever is on your mind. The idea was to create an opportunity to ask and answer questions in a more personal way without having the feeling of interrupting “more important” discussions. This was a great experience! I didn’t count all nationalities, but I picked up we had people from South Africa, India, Taiwan, Bulgaria, USA at the same time. This was simply awesome. Above it looks like I was hanging out with 35 people at the same time. This wasn’t the case. Unfortunately the hard limit is still 10 people at a time. There are “celebrity hangouts”, where you can record the event and have more people listening in, but unfortunately this takes away the opportunity to get involved. Sometimes I did have to mute people whose microphone was not set up properly (one time I think heard a rooster in the background), but generally I feel we fared very well. Many of the people in the hangouts were great Ubuntu fans and thanked for the work Ubuntu developers and contributors in general are doing. It was really heart-warming. Some had programmed before, even in Open Source projects and were keen to help out. So with the screen-sharing functionality I was able to demo how to fix a simple bug which was great. Thanks also to Evan Broder and Andrew Mitchell who jumped in and answered a few questions as well. I think I will keep these as an institution for now and announce events over the @ubuntudev twitter/identi.ca/facebook/google+ accounts. If you should ever want to do a hangout session, use the ubuntu-dev hangout, do it and let me know in advance, so I can post this more publicly. If you have any experience with events like this and have some new ideas, please comment below! Thanks again every one – this is just a great way to be in touch with the world-wide community of Ubuntu lovers! One thing I love about Ubuntu is that Ubuntu fans and contributors are spread around the whole globe. So when I started planning holidays in Morocco it was almost certain that we’d meet somebody from the LoCo team there. When I let everyone know about my plans, Adnane Belmadiaf immediately came up with dozens of ideas what I could go and visit in his country. For those who don’t know Adnane, he is one of the heroes behind many of our Ubuntu web projects, for example the LoCo Team Portal, Summit or cloud.ubuntu.com. Adnane is easy to work with, fun and as I found out in Rabat, he’s also a great tour guide. We arrived in Rabat around noon, quickly found a hotel and got a text message by Adnane saying that he took off the afternoon off work to show us around. Walking around was loads of fun as we not only saw lots of the city, but also because Adnane explained to us a lot about what’s going on in the country. First, I wish you a Merry Christmas. I know that you’ll be in Morocco. You can have a look on my albums maybe you can see some good plans to visit. Have a nice trip and in case of any help needed in Morocco you can inform me at <phone number> and I’ll take care. The Ubuntu community are simply the friendliest bunch on the planet. Amazing, isn’t it? Two weeks unfortunately isn’t enough to see everything, so we “just” visited Málaga in Spain, took the ferry to Tanger, went to Rabat and Marrakech, did a tour through the desert and flew home from Casablanca. We had a great great time. Thanks again everyone for making these holidays even more enjoyable! Big big hugs! ???? ????! Don’t you love it when you get contributions to your project when you didn’t expect them at all? By reaching out to contributors, thanking them and welcoming them to the Ubuntu community you do a lot to encourage them and help them integrate into your team more quickly. Generally I feel this is part of our culture already. generally talk more about what we’re doing and what’s going on, to explain where you need help. To help with this, we set up a team of people who work on weekly development news to get the word out. The only thing you need to do is send a quick mail to ubuntu-news-team AT lists dot ubuntu dot com with “[dev]” in the subject if it’s about Ubuntu development. In addition to this, this will give your work the publicity it deserves. You can also tweet/dent/google+ with the hashtag #thxubuntu. It’s human beings who make Ubuntu! Today is Ubuntu Community Appreciation Day, which is excellent. It’s the first time we do it and from now on 20th November will be a day to remind ourselves that Ubuntu is put together by humans and not “fabricated somewhere”. The human aspect of Ubuntu was what instantly won me over in 2004. This comes in multiple facets: From a product point of view, that computers stopped being dull and grey boxes, but devices I use to interact with the people I care about. The vision of Ubuntu, that it would always stay free and empower millions of people out there. I care a lot about the points above, but the most important point to me is “Ubuntu” itself, the recognition that “I am what I am because of who we all are“, which always at the center of all we did. Since day 1 of my participation in the Ubuntu community I was surrounded by people who became friends and it amazes me to see through how many ways I benefited: the amount of encouragement I got, the positive vibes, the uncountable learning experiences, the common feeling of making the world a better place together is something that still drives me and even on some of my slower days will bring an involuntary smile on face. The list of people I should thank is very very long, I can’t and won’t try to list everyone. I know that I will leave people out, but I can only hope I thanked you all enough in our conversations already. Big hugs to you all, you know who you are! First I’d like to thank our mustachioed leader. A lot of you will probably know Mark as the founder of the project and somebody who is involved in some of the difficult decisions. I admire the vision and energy with which he has been driving the project for seven years now, especially staying focused after all the shouting and swearing on the internet. Mark gets much less credit than he actually deserves. On a more personal note, I got lots of encouragement from Mark over the years, which I appreciate. Also I’m still glad Mark gave me the opportunity to come to Sydney and do much more. 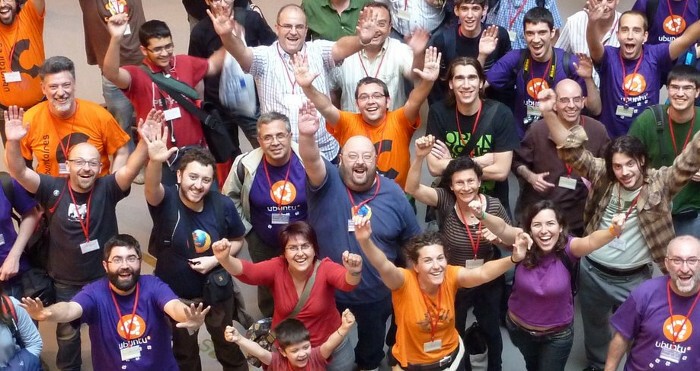 Also would I like to thank everybody who is involved in making more Ubuntu community happen. This obviously not only this bunch of hippies, but many many more who put a lot of work into organising meetings and events, thinking about how to get more people involved, dealing with conflict, getting the message out there and loads loads more. It often is a thankless task, it doesn’t come with fortune and fame, but is still rewarding to see if your part of the community is thriving and awesome things happen. 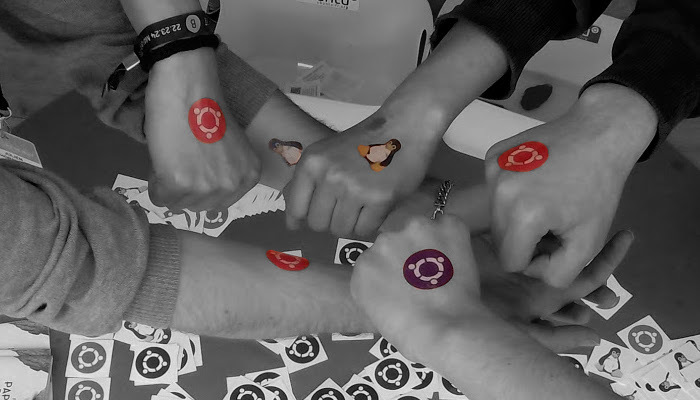 If you are not there already, make sure you join #ubuntu-community-team and get a hug! Another group of people I deeply appreciate and would like to thank is: first-time contributors! I know how hard it is to get involved for the first time. It’s not only the steep learning curve, but also that you don’t know anybody in the project yet and you might be worried that you make a fool of yourself. Still there is lots of new contributors and their level of excitement about having gotten their first contribution into Ubuntu is just fantastic. It never ceases to make me smile if I get a mail where people write about their experience. Thanks for sharing your energy and being awesome! A big big hug to everyone who helps to make Ubuntu happen. You rock! If you lack context, here you go. You don’t see me blogging about things outside the Ubuntu world very often. OK, an occasional mixtape every now and then or some holiday pictures, but I generally try to stay away from topics such as politics or things that happen in the world elsewhere. This is not because I don’t care or don’t have an opinion – it’s quite the opposite. I just prefer to not get drawn into huge arguments about who’s right and I try to avoid writing about and singling out particular events and miss to mention others. By now most of you will have heard about the horrible events in Oslo. As my girlfriend is from Norway, I paid even more attention to the news. The reason I’m writing about this is that among all the usual suspicions and noise in the news a few people stood out and truly impressed me. If you haven’t read much about Oslo and Utøya in the last days, read these two chilling first-hand accounts of people who survived Utøya: from Khamshajiny Gunaratnam and Debian contributor Tore Sinding Bekkedal. After all of this, it would have been very much understandable to show any signs of knee-jerk reactions. The people I mentioned above reacted remarkably to the situation. It’s very inspiring how they chose to stand with their humanitarian values. It’s unfortunately very uncommon nowadays, especially for politicians, who in situations like this are under a lot of pressure. These leaders have my deep respect for choosing to do otherwise. As part of the Ubuntu Development videocast, I had the great pleasure of interviewing Jani Monoses, Michael Vogt and Oliver Grawert yesterday. We are all together here in Dallas and I successfully managed to drag them out of meetings and away from work and talk to them about Ubuntu Development and how they got involved. Unfortunately we kind of messed this up. Up until 8 minutes, 10 seconds you will only be able to see us gesturing, there’s no sound. So at 8 minutes 10 seconds into the video we figured out the problem and started from scratch. What I’m really happy about is that Jani, Michael and Oliver all are great friends of mine and I all got to know them early on when I got involved in Open Source development. They all supported me and helped me out. As I mentioned earlier, today I’m working with Ara, Matthias, Michael and Yaiza at Büro 2.0 and we just finished a very funny video cast together. Normally I would’ve done the next video cast next week, but with slowly approaching Christmas everybody has probably better things to do than watching Daniel rambling on about Ubuntu Development. So we’ll instead do the “Christmas special” this week. Tomorrow, 16th December, 12:00 UTC. This time I won’t be sitting at home in front of bookshelves, but I’ll be at Büro2.0, Berlin’s fantastic Open Source coworking place. I’ve been working from there for about a year now and I love it. Lots of fantastic people there, all working with Open Source things. In addition to Büro2.0 awesomeness, I’ll be joined by my Berliner colleagues from Canonical, not only heroes but also awesome friends. It should be a lot of fun, so make sure you tune in. I’m incredibly happy with how the patch pilot programme is working out. We’ve been making steady progress at reducing the number of items up for review. Looking at the sponsoring queue there are still a few older items that we should clear out. I’m convinced it would make us feel better about the state of things and make it easier for us to stay on top things. Old patches often don’t apply any more, require more work, etc. The graph above seems to say “we never really get below 40″. Can we do it? I’m sure we can! Let’s all try to clear out the old ones. It’ll make the world a better place! In last week’s videocast we talked about “getting set up” for Ubuntu Development. Everybody had a gpg key, ssh key, all the tools, a pbuilder and settings in Launchpad sorted out afterwards, which was great. If you want to have a look at the video again, you can do so. Up until now I didn’t find a good way to show links/terminal output yet. Are there any suggestions to do this in a better way? If you check out the video above you’ll notice the old-fashioned way how I worked around the problem. Ubuntu development screencast: tune in! Thursday, 9th December at 16:00 UTC* I’ll be online with another installment of “Ubuntu Development with Daniel Holbach”. Please help to spread the news about it… and bring questions! I blogged about the new Harvest a couple of times already. Yesterday we released 0.2.4 which fixed a bug which was filed more than a cycle ago… it merely said: “import json”. The way Harvest works is that it reads a list of URLs that list opportunities, so Harvest is very easily extensible. It doesn’t need to know about bug reports, merge requests, upstreams, downstreams and the like: it just knows about packages and opportunities. It was only a matter of time that this wasn’t enough any more. Some people suggested to add something like “long description” or “severity” to opportunities to make it clearer what they are about or to make an informed decision. So we moved to JSON where it’s very easy to add optional arguments and you don’t have to guess arguments based on their position. Only “source_package”, “short_description” and “link” are required. Everything else is optional. I’d LOVE to see more opportunities for Harvest coming up. Once you got your script set up, just bzr branch lp:harvest-data add the URL to the JSON output, and propose a merge. So you like Ubuntu, enjoy “making things work again”, like to work with others, don’t mind reading a bit of documentation, you’re exactly the person we need. If you were always wondering “what can I work on?” I suggest you have a look at http://harvest.ubuntu.com/opportunities/. If you have a look at the page you’ll see that it’s divided into two parts: on the left side you can control which kind of development opportunities are shown: you can limit the results to packages (or package sets) and to certain types of opportunities. The results will be shown on the right side. So once you picked an opportunity that looks interesting to you and made it work, you can propose the change for inclusion in Ubuntu. The great thing is that we have patch pilots working every day to get your changes reviewed and into Ubuntu. If you need help, just head to #ubuntu-devel (on irc.freenode.net) and check who’s piloting right now, the information is in the topic. I’m very happy with how the “Patch Pilot” programme is coming together: it’s just been a week where in addition to people who do reviews of branches and patches every day, we have patch pilots who spend time in #ubuntu-devel reviewing code. If we keep up the good work, it seems like we can get the number of waiting requests down to 0!